I've just bought a second hand Lexmark X5470 printer. What cartridges suit please? If you are on the lookout for a new home printer, there are tons of options available to you. So many options might seem like a positive thing at first, but it does mean that some printers will perhaps slip through the net as it were. Well, the Lexmark 5000 Colour Jet is a printer which is worthy of further investigation and as such, here is a brief review of the Lexmark 5000 ColourJet printer; something which will hopefully allow you to make an informed decision when it comes to parting with your hard earned cash. The design of the Lexmark 5000 Colour Jet is certainly worthy of note because finding a home printer which is attractive and functional is not necessarily an easy task. Thankfully, the Lexmark Colour Jet 5000 has plenty to offer on a physical basis as it incorporates sleek design and a black and charcoal finish. 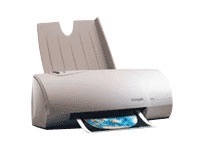 Put simply, the Lexmark 5000 Colour Jet printer would fit into a wide range of environments and spaces with ease. The way a printer looks means little if the printer itself doesn't offer a fair few practical features. Thankfully, the Lexmark 5000 Colour Jet is up there with the very best where features and print outs are concerned. During our tests, the Lexmark 5000 colour inkjet printer created high quality colour images and even the text documents were clear and easy to read. Picking fault with a printer such as the Lexmark 5000 Colour Jet is never an easy task, but if we had to find issue with this machine, it's that it might be a little pricey if bought brand new. However, you pay for what you get with a printer and the Lexmark 5000 Colour Jet is a very tidy and practical machine, one which more than deserves its price tag.